Blended finance is the strategic use of development finance for the mobilization of additional finance towards sustainable development in developing countries**. The World Economic Forum and the OECD, through the ReDesigning Development Finance Initiative (RDFI), have been actively engaging public, private and philanthropic organizations since 2014 to facilitate and scale blended finance. The Blended Finance Toolkit is a product of the RDFI, and is designed to provide a helpful overview of the Blended Finance ecosystem and its benefits, while offering solutions for adopting this approach to finance and investment in emerging and frontier markets. 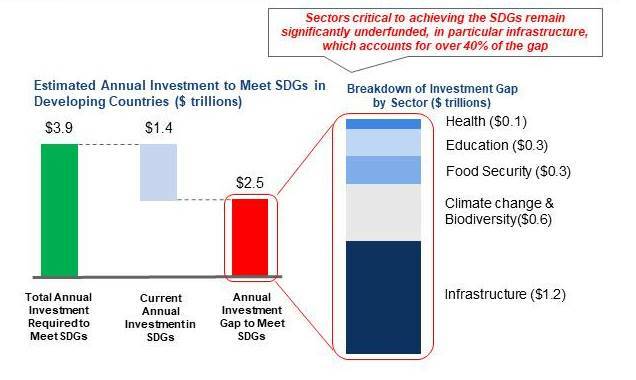 * Adapted from UNCTAD, World Investment Report 2014. Current annual investment of US$1.4 trillion includes both public and private investments, defined as capital expenditures. The estimated annual investment gap is based on the average of the low and high estimates.